We've owned several breeds over the years, and I thought that the German Shepherd was about as smart as dogs got...that said, our last three dogs were Belgian Sheepdogs*. The first one was a male and "Hassle" lived up to his name...he was a handful...smart and pushy both...he did not suffer fools gently...he kept us on our toes. The next three were females and I think they were even smarter....each knew a number of words and giving them commands was easy....no yelling, no bucking the system and all three both liked the male in the house best. Holiday and Bathsheba aka Sheba were very special dogs ... then came Aviva...the smartest and brightest of all. I think she reads our minds. I'm just about ready to take her out for her evening work-out...so I got the gin bottle out whereupon 'Viva stared at me as I went for the vermouth... by the time I mixed the martini she was waiting at the 'fridge for the pearl onion addition. I'm off now with the Kong ball and the martini....it's the high point of our day. My Cockapoo is the smartest I have owned. He has a large vocabulary. If I am leaving, I ask him if he needs to go outside --and I have come to trust him if he doesn't move. Just as I appreciate him going out and doing everything he needs if he heads for the door. It I am always amazed when he starts gulping down water as soon as I return, which implies he has made a conscious decision not to pee in the house while I am gone. At age 11, he is still one of the most active and athletic ones at the dog park, and perhaps the most popular one there because of the way he treats people and dogs. I really lucked out with this dog! Not bragging; just expressing my appreciation. My best friend in high school had a cockapoo - extremely bright dog. I am not a fan of small dogs, but I loved Teddy. My smartest dog was a stray mutt we adopted. 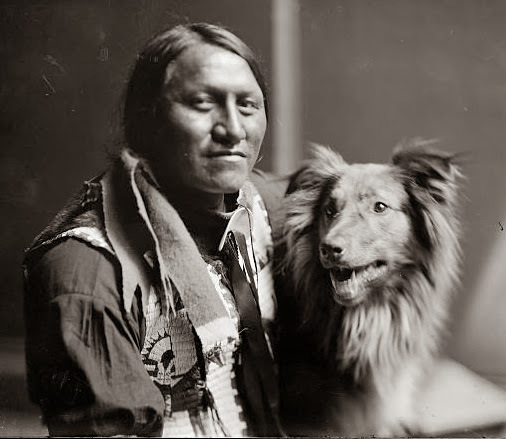 He closely resembled the herding dogs that were commonly seen in old photos with Navajo sheep herders, hence our name for the "breed" of Navajo Retrievers. This dog was absolutely brilliant. 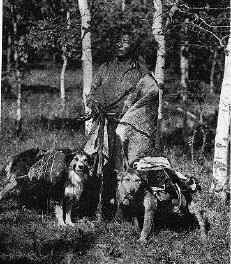 Low quality photo, but that dog on the left looks very similar...he had a long, curled tail. I've had two dogs in the past that were just mutts that someone dumped out by our farm and we took them on. One was a Bloodhound Boxer mix (they thought) and the other was a cattle dog mix. I swear that both of those dogs were smarter than some of the kids I went to school with. Now we have a Shih Tzu that is 15 years old. He picked up ringing the bell to go outside in one try. Honestly, I rang the bell, opened the door for him one time and the next time he wanted out, he rang the bell. As a puppy, he never peed in the house. Amazing. On the other hand, he only knows one trick because he was just to dumb to learn any others. I just don't know about him -haha. I think he only knows one trick because he was smart enough to figure out that one would be enough.